On Tuesday 13 January, asylum seekers in Mike Compound on Manus Island began a mass hunger strike. A few days before, Australian immigration officials had announced that up to 50 people found to be refugees would be moved, forcibly if necessary, on 22 January to new accommodation at the Lorengau settlement on Manus Island. By the next day, the protest had swept the detention centre with hundreds of asylum seekers in every compound joining in. The biggest sustained protest against Australia’s offshore detention regime had begun. Just 11 months before, on 16 February 2014, G4S riot squad had brutally attacked a peaceful protest in Delta Compound, leaving one man with a badly cut throat and scores of others with broken bones and split skulls from baton blows. That memory, and the on-going death threats against asylum seekers, have hung heavily over the detention centre. The prospect of being forced into unguarded accommodation was the fear that drove the hunger strike. It also raised a wider concern for every asylum seeker: was there any prospect of ever being securely resettled in PNG? Immigration Minister Peter Dutton channelled Scott Morrison, denying there was even a protest happening. But this time, mobile phones in the compounds meant that photos and videos documenting the protest streamed out, exposing the lies of the Immigration Department. What followed became emblematic of the brutality and intimidation used by the Department to try to break the protest. On 18 January, Immigration began raiding the compounds rounding up so-called ring-leaders. The hunger strike grew to 800 strong– eighty per cent of the whole camp. That day, the Immigration Department took away Delta Compound’s only drinking water. After depriving the hunger strikers of water for 24 hours, Australian Transfield guards, with Wilson’s riot squad back by PNG police, stormed Delta Compound, arresting asylum seekers and stripping the compound. That night there were over 90 people in Lorengau police watch-house and jail. Alarmingly, on the first night, there was a demonstration outside the prison of around 50 locals armed with knives and machetes. The day refugees were to be moved to the new accommodation came and went, with no one forcibly taken. The hunger strike went on until 27 January, after Foxtrot compound was also attacked and stripped, in a desperate effort to find the phones that were still getting messages from Manus to an ever more interested international media. All the asylum seekers are now out of jail, but Chauka and Charlie compounds are still being used for “troublemakers”. As Solidarity goes to press, there are still 36 people in Charlie. Security cameras have been installed in every compound to step up the surveillance. There are still threats that “ringleaders” could be subject to criminal investigation. The International Organisation of Migration has been trawling the compounds (and the prison) for business—arranging to send asylum seekers back to their home countries. That so few are willing to take payments of up to $10,000 to go home says everything about their real fears of persecution. The hunger strike seems to have put paid to any idea of forcibly shifting refugees to new accommodation. Only 14 refugees have voluntarily moved. 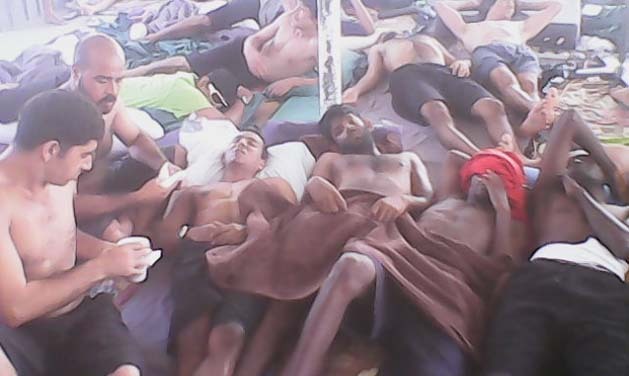 But like never before the Manus protest has pushed the horror story of offshore processing into the mainstream.